Looking for Mattress Cleaning in Auckland? Do you want to breathe easy and sleep soundly on your clean mattress? Do you see mattress discoloration or mold after time in storage? Then book Alex Cleaning Solutions and let professionals make your mattress look and smell good and be clean again. Mattresses do not stay new for long. Mattresses like the carpet are made for a long life. Usually a mattress has around 5-10 years warranty. 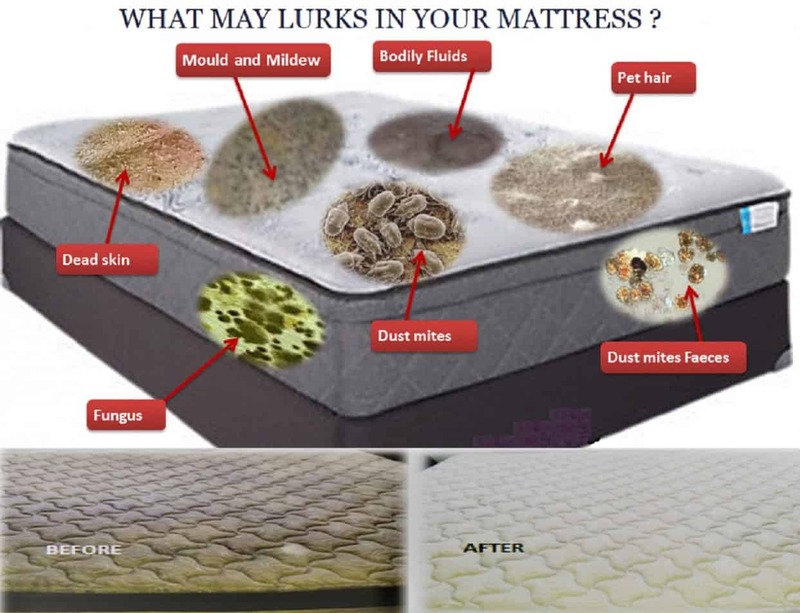 There are different types of mattresses and some of them even claim to have anti-bacterial cover. You may ask: Do I have to have my mattress cleaned? If you suffering from dust allergies and waking up congested every morning, why not say: “I’d had enough”! Alex Cleaning Solutions deep clean system can make a substantial difference, and allow you to sleep comfortable knowing your mattress is clean. We also recommend in addition, that you have your carpets, couches professionally cleaned regularly in order to reduce the dust mite population in your home. Alex Cleaning Solutions also can help significantly with bug bugs. Currently there is a bed bugs epidemic in USA and around the world. Most warning fact is that it effects not only budget hotels and motels, but the expensive ones. With most New Zealanders enjoying their overseas travelling. Hence its highly possible to bring home from the journey some unwanted bed bugs. If infested, even throwing away the current mattress will not help. You will need professional help. Book us for mattress cleaning Auckland to resolve the issue. Another cause for mattress cleaning can be our pets, kiwi’s alone have 4.6 million animal companions. According to a survey by NZAC in 2016, around 64% of household have a pet. Be aware, pet owners are in higher risk of mattress linked allergens and irritations as just one accident can mean the animal’s fluids can go through normal pad or protector and will be embedded deep in the fibers of your mattress. This in addition can cause mold and bacteria to grow. This seems to also occur often amongst small children, older people or some people facing bladder weaknesses. Once this begins, it’s very difficult to stop it from spreading. Furthermore, urine can also chemically break down your mattress fibers making them weaker. Drool, vomit and other substances also can have a similar effect so it’s always best to be safe than sorry , and clean your mattresses often. 5 Reasons Why chose us? #1 Auckland Cleaning – Our mission is a 100 % customer satisfaction. Provide professional mattress cleaning Auckland using eco-friendly materials. Fast response and no hidden cost, with discount if done with carpet cleaning or pest control. Let us clean for your mattresses! Take the hassle away, and complete it cost effectively. A mattress that is professionally cleaned not only looks great but also a clean mattress can help prevent allergic reactions or asthma. Hence the result will be outstanding and at a fair price for you.